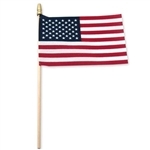 USA Stick Flag 4" x 6" Standard . US Flags This American Flag 4" x 6" is a great low cost choice for parades, holidays, or giveaways. 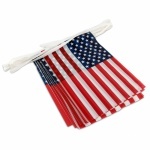 Standard USA FLAGS are printed on cotton fabric and stapled to a 10 inch wooden stick. The edges are cut.